Trump Adviser Invested in America's Collapse? Home » Trump Adviser Invested in America’s Collapse? Trump Adviser Invested in America’s Collapse? 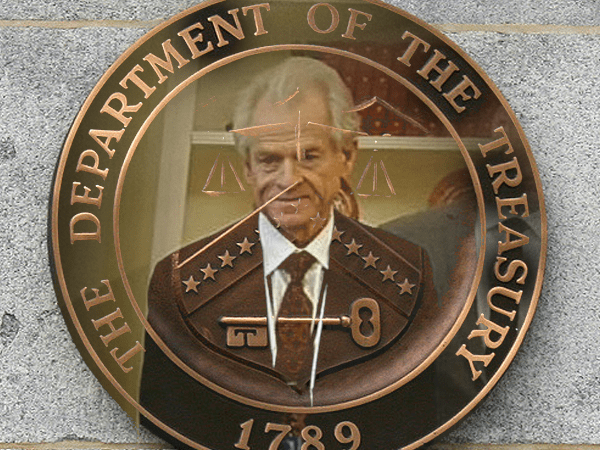 Recently released financial disclosure forms show that Peter Navarro, one of Trump’s top trade advisers, could be setting himself up for a handsome payday if U.S. Treasury Bonds collapse — raising serious questions about his support of recent policy decisions. But independent economists say the impact of these orders might not be as rosy as Navarro says. Further, Navarro is championing additional trade policies that could have serious consequences for the value of United States’ Treasury securities. Why is all this so shocking? Navarro is heavily invested in a short position through the TBT ProShares UltraShort 20+ Year Treasury fund, according to recent financial disclosures. Essentially, that means Navarro stands to collect a healthy profit if U.S. Treasuries take a nosedive. Let’s take a closer look at what could be the world’s first unholy marriage of government corruption and insider trading. One of the executive orders signed on March 31 deals with the U.S. trade deficit. On the surface, the order appears to stand up for the U.S. in ongoing trade relationships abroad, but there’s a dark side not many are talking about. The order gives our government an open-ended opportunity to massage our trade deficits to their advantage. And since Navarro is holding a considerable investment with profit potential from rising trade deficits, there’s arguably a huge conflict of interest. You see, when the U.S. runs a trade deficit with other countries, it essentially means we’re importing more goods from those countries than we’re exporting to them. How do we make up the difference? We pay those countries in U.S. dollars. Invest in private American companies or buy American goods and services. Invest in the American government and buy federal securities like U.S. Treasury Bonds. Keep those dollars outside the U.S. economy altogether, investing in other countries or spending them elsewhere. For most of American history, the dollars we’ve sent outside the country to cover our ongoing trade deficits have usually come back into the U.S. economy one way or another (through options one or two listed above). And when that’s the case, running large trade deficits isn’t terribly damaging. But today, that trend is beginning to shift. The rest of the world is losing confidence in the U.S., and all those dollars we’re sending off to pay for our deficits aren’t boomeranging back like they used to. Navarro’s Bet Against the U.S.
What happens to the value of U.S. Treasury Securities when the rest of the world starts selling them off? They sink like a stone. This past October, we discussed how U.S. Treasuries experienced their biggest and fastest selloff in recent history. Over the course of just one month, the amount of “custodial paper” in the U.S. Treasury (debt held by foreign countries) dropped by $22.3 billion to its lowest pre-2012 level. That means foreign governments were “cashing in” their holdings in U.S. Treasuries — many of which were bought using dollars paid to compensate trade deficits. Then we reported an even more dramatic tumble in U.S. Treasuries in November, showing a continuation of the trend. 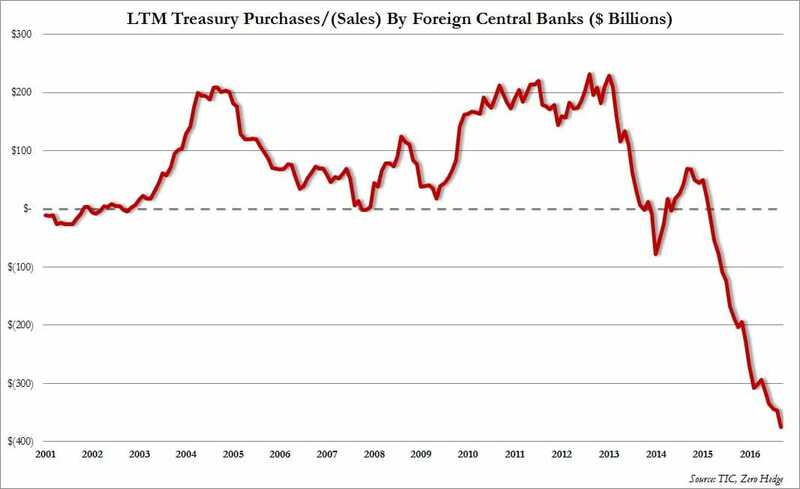 Foreign governments went on the longest, deepest streak of U.S. Treasury liquidation since 2001. Here’s the chart to refresh your memory. Navarro has gone on record saying trade deficits aren’t so bad, suggesting the U.S. shouldn’t shy away from running them up further and further. He’s even gone so far as saying they could be a strategy to promote growth just this year. That might be true if the rest of the world weren’t dropping U.S. Treasuries like a hot potato. But why on earth would Navarro make this assertion given the current climate? Navarro knows full well that future increases in U.S. trade deficits won’t result in foreign investment back into our country like they have in the past. But if we go ahead and push those deficits up anyway — and foreign governments keep the dollars we give them in exchange outside the country and continue to pull out of U.S. Treasuries — Navarro’s short position against U.S. Treasuries would skyrocket. At worst, Navarro’s questionable actions suggest we could be in store for a serious economic firestorm, sparked intentionally for his own benefit. At best, it means Navarro has a gloomy outlook on the president’s foreign trade strategy, and simply wants to make a few bucks when it fails. The ominous signs of an eventual stock market accident are numerous. Insiders [are] headed for the exits, as insider selling hit 6-year highs in March while retail money poured into the stock market and NYSE margin debt hit an all-time high. The ratio of insider buying to selling hit a 29-year low. Corporate debt levels are at all-time highs despite a supposed 8-yr economic ‘recovery.’ Much of that debt issued was used to buyback stock as opposed to investing in business operations, maintenance and expansion. Regular Americans don’t have the same “inner circle” advantage, and they’re in for a big surprise if these bets against the U.S. are right — and considering the people making those bets, it would be silly to look the other way. How can the American public prepare their savings for what’s ahead? Could they even set up their own way to profit — just like the insiders? Fortunately, backing your savings with gold might accomplish both. During major market crashes, gold has generally not only prevailed but prospered. On top of that, it has remained a solid investment in previous periods of turmoil for U.S. Treasuries and trade policy-fueled economic turbulence. The insiders are protecting their wealth with power and trickery. Maybe it’s time you protect yours with gold.